It’s impossible not to have fun when hanging out with this goofy, lovable breed, whose personality is as unique as its looks. 1. They were bred to fight. Bull terriers are directly related to bull-and-terriers. As their name suggests, they were a cross between bull dogs and various terriers. Breeders thought that the tenacious spirit and agility of the terrier mixed with the brute force of a bulldog would create the ultimate fighting pit dog. The breed was known as a “canine gladiator.” Luckily, dog fighting and other blood sports were outlawed in England thanks to the Humane Act of 1835. Bull terriers were given other tasks, such as ratting and being companions. 2. One man decided to class them up. In the 1860s, James Hinks of Birmingham, England saw potential in these dogs, and decided to make them a distinctive breed. He crossed them with the now-extinct white terrier, as well as the Dalmatian and possibly the border collie. Hinks bred all of his dogs to be pure white, with a longer face and no bow legs. This new-and-improved breed boasted more consistent, sophisticated looks than its predecessor. Originally, these fancy dogs were all white and called “White Cavaliers.” Later, the bull terriers were bred with Staffordshire bull terriers, creating bullys with colors such as brown, black, red, and brindle. The breed's popularity grew rapidly, and by 1897, the Bull Terrier Club of America was established. 3. They have some of the canine world's most distinct faces. Bull terriers are known for their long egg-shaped faces that slope in the front into a Roman nose. Their eyes are also unusual: The bull terrier is the only registered breed to have triangle shaped eyes. 4. OCD is common in the breed. A dog chasing its tail can be cute, but it’s also possibly a sign that the canine has obsessive personality disorder. Studies have shown that bull terriers and German shepherds are much more likely to compulsively chase their tails than any other breed. Other signs of the disorder include frequent chasing of shadows and compulsive pacing. Worried about your dog's obsessive behavior? The ASPCA says that keeping him or her busy can help. 5. They’re the clowns of the dog world. Bullys might seem a little intimidating with their muscular appearance, but they’re actually very sweet, gentle dogs. Known for their goofy and fun personalities, bull terriers are perfect for active families. The dogs love to play and get into trouble. 6. Some are hard of hearing. As is the case with Dalmatians and other dogs with piebald coats, bull terriers sometimes have trouble with their hearing. It was believed that deafness could be bred out of the dog, but many breeders continued to use deaf dogs regardless. Others simply didn't realize that the offspring of dogs deaf in only one ear could be totally deaf. 7. Bull terriers make good spokesdogs. Bullys are no strangers to the limelight. Spuds MacKenzie was a well-known bull terrier that worked as the mascot of Bud Light. The party dog was marketed as a man’s dog, often with a gaggle of women (“Spudettes”) on paw. In reality, the cool bachelor-hound was a female named Honey Tree Evil Eye, or “Evie” for short. Regardless, the people loved it: Between 1987 and 1988, Bud Light sales increased by 20 percent. Another laid-back bull terrier in the business is Bullseye, the Target dog. The mascot sports Target’s logo like a spot on her eye (don’t worry, it’s non-toxic dye). She's appeared in commercials since 1999, so naturally there has been more than one Bullseye, but how many exactly is shrouded in mystery. The popular dog flies first class, knows a host of celebrities, and has even been immortalized in wax at Madame Tussauds in New York. 8. One was the official greeter of Juneau, Alaska. Patsy Ann was born in 1929 and came to Juneau as a puppy. Despite being deaf, the bull terrier had an uncanny ability to tell when and where ships were coming in to dock; she would come to the wharf and visit the unloading boats. Dubbed the official greeter, Patsy Ann was loved by all. In her spare time, she would visit the locals who greeted her with scraps and treats (in her later years, she got quite plump). Some say that the bully was photographed more than Rin Tin Tin. Patsy Ann lived to the ripe age of 13 (91 in dog years) and a statue was erected in her honor. Juneau still sells merchandise with her likeness to this day. 9. You can get a smaller one. 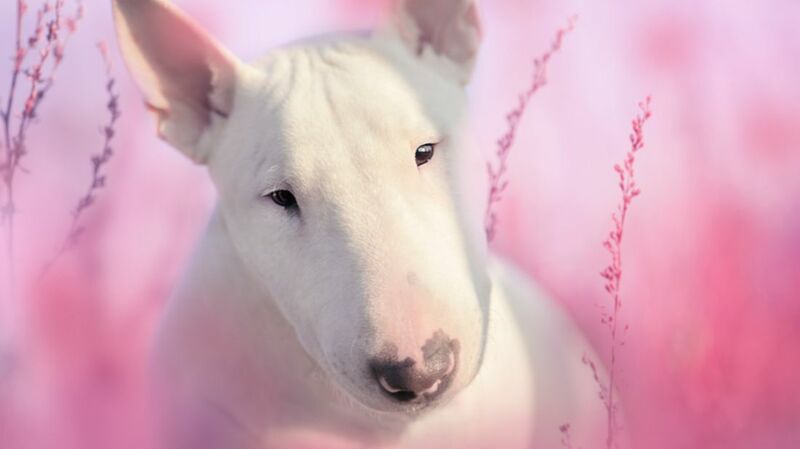 Although technically a different breed, miniature bull terriers exist. These smaller dogs only grow to be about 14 inches tall, while their larger cousins can be up to 21 inches. These dogs are also hypoallergenic and shed much less than their larger counterparts.